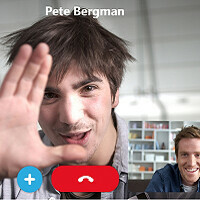 Wondering which as the best free video calling apps for smartphones and tablets? We've rounded up five solid picks, and we're ready to share them with you. Note that you may already know - or even use - some of the apps on this list, but we really can't help it if the most popular apps are also the best. Instant messaging is one of the main advantages of owning a smartphone. Just ask yourself: what's better than being able to stay in touch with your family, friends, and coworkers from anywhere you may be in the world? After the age of text-based instant messaging came and passed, came the era of voice calls, and we've seen some developers taking this idea to the bank over the past couple of years (Skype and Whatsapp are the best examples). However, while texts and audio are great and all, it turns out that more bandwidth, better cameras, and more processing power have already ushered in the next awesome feature: video calls. Nearly all iPhone or iPad users are probably familiar with FaceTime, Apple's own video calling app. Although FaceTime comes with the obvious limitation of not being available outside of Apple's mobile operating system, it's still probably the best video calling app if you want to place video calls from one Apple device to another. On iPhones, FaceTime can be accessed right from the contacts app, which helps a lot with placing quick video calls without going through a bunch of extra hurdles. Furthermore, the video calls run buttery smooth and you're unlikely to see dropped calls when using the app. On the downside, FaceTime lacks the bells and whistles of other apps on this list, especially if you're looking for a complete messaging app, not just a quick way of placing video calls. Although Hangouts comes pre-installed on most Android devices, the app is also available on iOS, which is invaluable if you want to place video calls between the two predominant mobile platforms. Aside from the ability to place video calls to any person in your contact list, Hangouts also allows up to 10 users to join in on a group call. This feature makes Hangouts the perfect app if you want to engage in a video conversation with your entire family at the same time. Note that there are other apps out there that allow for group video chats, but Hangouts it's the most popular app to offer this feature. Now that we've covered the default video calling apps on both Android and iOS, it's time to look for third-party alternatives. We'll start with Viber, a popular messaging app that added video calling back in 2014. Viber adds an interesting twist to the mix, allowing the user to choose between sending a pre-made video in a chat session or engaging in a live video chat. Aside from its newfound video calling capabilities, Viber also allows you to send stickers, messages, photos, voice messages, or even share your location. Viber is an all-purpose messaging app if we've ever seen one, although the interface is probably less intuitive than it should be. As an example, you can't start a video call directly; instead, you have to place a new call and then select the video option from the app. No list of the best video calling apps can be complete without mentioning Skype, at least because of the app's insane popularity. As most of your friends are probably using Skype already, this one is a no-brainer first pick if you're interested in video chatting across multiple platforms. Skype is available on iOS, Android, Windows, and even on Windows Phone. On the downside, the Microsoft-owned messaging service is known for not being very reliable. If you can't afford to drop out of the radar, make sure to have an alternative installed on your smartphone, as you'll never know when Skype goes down for hours, leaving you isolated from your friends and coworkers. Our last pick is the most unpopular video calling app on this list. Imo is not the complete messaging app that Hangouts or Skype claim to be, but it's still a solid pick if you're only looking for a quick way to place and receive video. Imo has a simple and intuitive user interface that allows the user to place a video call right from the contacts view. While we love that a simple tap is enough to get a video call started, the app definitely needs some extra features before it can become a well-rounded competitor in the messaging app market. In iOS, you can go straight to FaceTime within a regular call- and it will switch as soon as the other party accepts. A few questions: How do you know if the person you want to make a video call has hangouts (or other apps)? Can you flip the camera from front to rear during conversation with hangouts and other apps? Is it the same as FaceTime: just dial the number and press FaceTime from the call app or do you have to open a different app and send and invitation? Are those difficult questions to answer? No its not at all easy or convenient as FaceTime. 1. Simply click on 'New Video Call' option. It will show you a list of your contacts. The ones who have inverted commas on their thumbnail are the ones you can make video calls with. 2. Haven't tried it yet. 3. No. You don't need to leave the app to make a video call. However, I don't think you can switch a regular call to video call during a conversation. 1. How do you know the people you are calling has FaceTime? 2. Yes, you can flip cameras. 3. Yes, from contacts you can choose if you want to have a call, a video call or a sms. Nor knowing what other can do and asking that, thinking your favorite will have exclusivity, it is not pop up you in a good light. Enjoy all the platforms and choose what's fitting best your needs. How do you know if your contact has FaceTime? It's systemwide on iOS: for example, when you're texting with someone their bubbles show up as blue instead of green - then you know the user is on iOS, so they have FaceTime. Or: when you bring up contacts (either contacts app or call app) it will give you option for FaceTime among just call and text (if there's no FaceTime icon that means either the user disabled it on their iOS device or he doesn't have it). Or during the call (either regular call or FaceTime audio call) there is a highlighted FaceTime app that you can tap and switch to during a call. The reason for my questions: FaceTime held A LOT in my line of work (I'm a residential contractor). Unfortunately some of my customers use android - I want to assume that if they have android they have hangouts, that even if they don't know about having it on their phone I can still video call them without asking if they have it!!! On iOS device, I have facetimed customers that never, ever used FaceTime before - all they gotta do is answer the call. If I install hangouts, can I assume if I video call any android user he will be able to answer without any other setup? Also is the native call app tied to hangouts (or do I have to initiate a call from hangouts in order to be able to switch to video during a call). Stop assuming that I'm trying to troll. These forums are trolled so much that everyone (including me) are on defence, so I get it. I'm using the 3GPP native video calling feature on my Samsung phone. it's as easy as making a regular calls. and i never use those apps, so i can't answer that. How face time is your #1 app? It works only on iOS. Though I have heard from people face time has good quality even on poor networks. But unavailability on all major platforms is serious drawback. Skype and hangouts are by far the best voice/video/phone calling apps. I think they meant "Most Used" video call apps. Face time is good but only for ios users. That alone makes it unusable to me. I think you forget about BBM and Whatsapp too, including the Chinese WeChat and the Japanese LINE. As an Asian guy, I have a question for the author. Where the hell is Line? Most of our audience is either in North America or India (and growing in Europe), so Line doesn't get much coverage because it's mostly big in east Asia. How many people really use video calling? I'm curious. R-HUB HD video conferencing servers is another very good video calling app which works on iOS, Android, Windows, MAC etc. It allows one to conduct video conferencing with 30 people at a time.